CHERY RUSH It's fun, it's cute, it's smooth, and it's mighty splash. A mixed-case font (Uppercase and lowercase) with lots of combination possibilities, make greats fun display! its good to make a logotype, sticker, fun kids sign, and other lettering project. This fun is perfect combination uppercase and lowercase. Copyright (c) 2018 by Degi Kurniawan. All rights reserved. 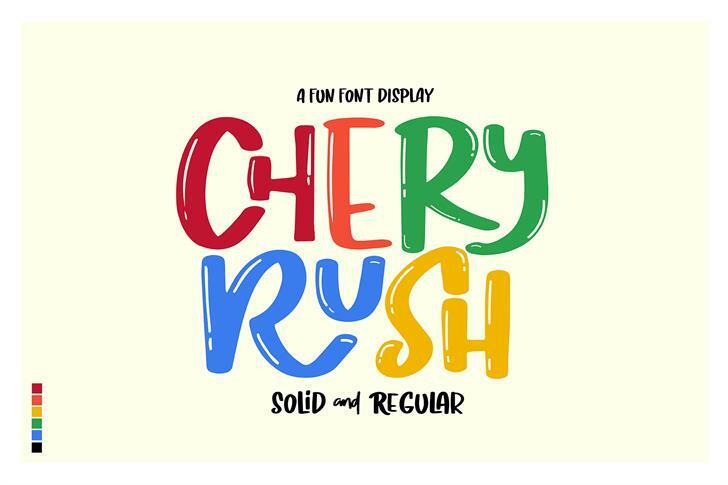 Chery Rush Regular is a trademark of Degi Kurniawan.